The Soccer Sports Cage is great for competitions, sporting events, school events, corporate events, and more! 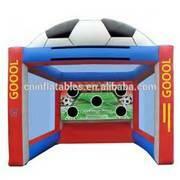 Rent the inflatable soccer sports cage to see who can kick the fastest and get score a goal! Includes soccer banner and radar along with soccer ball.